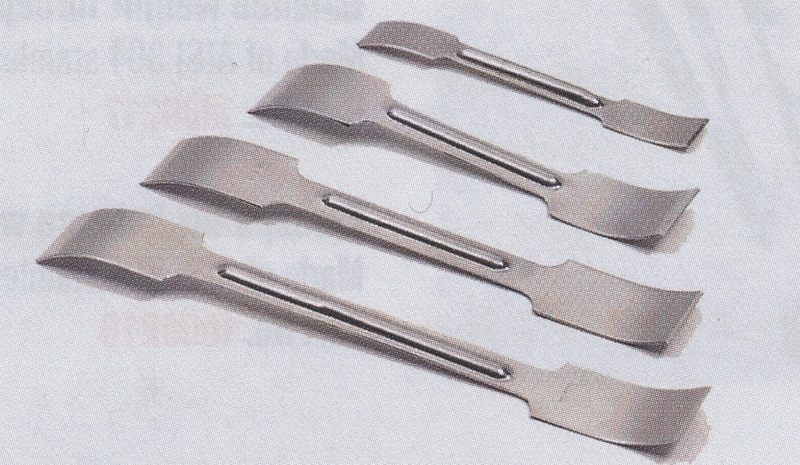 These scoops, spatulas, spoons, ladles, paste and utility knives fulfill a variety of common laboratory requirements. 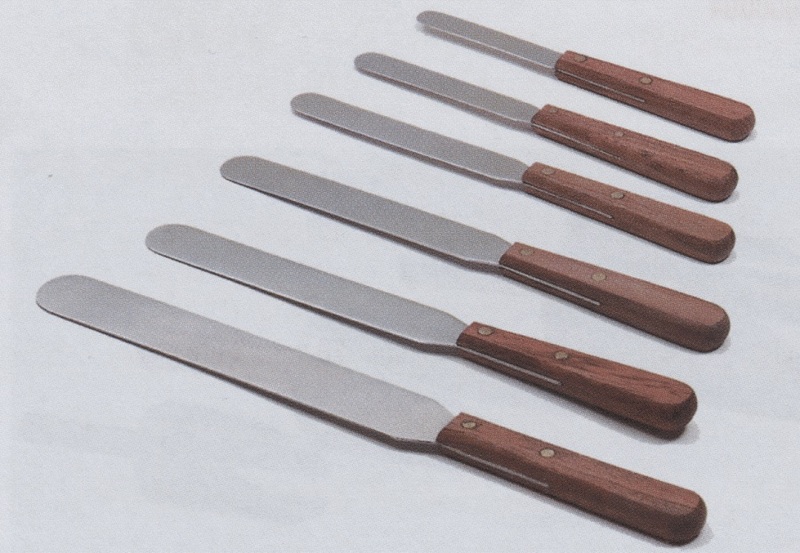 The spatulas are listed first, roughly by the width of the narrowest end, starting with the micro-spatulas. 1001585 Micro-spatula with flat spoon end, length 150 mm, spatula width 4 mm, pocket clip. 1001586 Micro-spatula with curved ends, length 150 mm, spatula width 7 mm, pocket clip. 1027680 Micro spatula with flat ends, made of AISI 304 stainless steel, width 4 mm, length 80 mm. 1277100 Micro spatula with flat and spoon ends, made of AISI 304 stainless steel, spatula width 4 mm, spoon dimensions 7 mm long, 5 mm wide, 1.8 mm deep, length 100 mm. 1001581 Micro spatula with curved ends, made of AISI 304 stainless steel, spatula end width 7 mm, curved end length 20 mm, total length 150 mm. 1278140 Double spatula semi-micro, rectangular and oval shaped ends, made of AISI 304 stainless steel, end width 7 mm, end length 35 mm, overall length 140- mm. 1000855 Spatula with flat and grooved ends, made of AISI 304 stainless steel, flat end width 9 mm, grooved end width 8 mm, overall length 180 mm. 1095210 Analytical type flat spatula with spoon, made of AISI 304 stainless steel, overall length 210 mm. 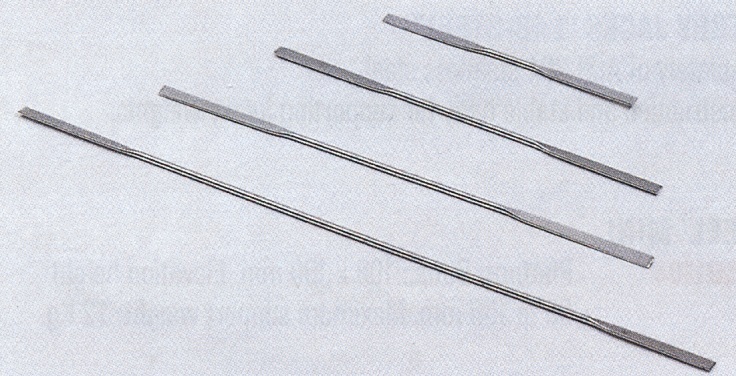 Rectangular end 40 × 8 mm, spoon end 30 ×18 mm. 1001587 Spatula flat with grooved end, length 150 mm, spatula width 9 mm, pocket clip. 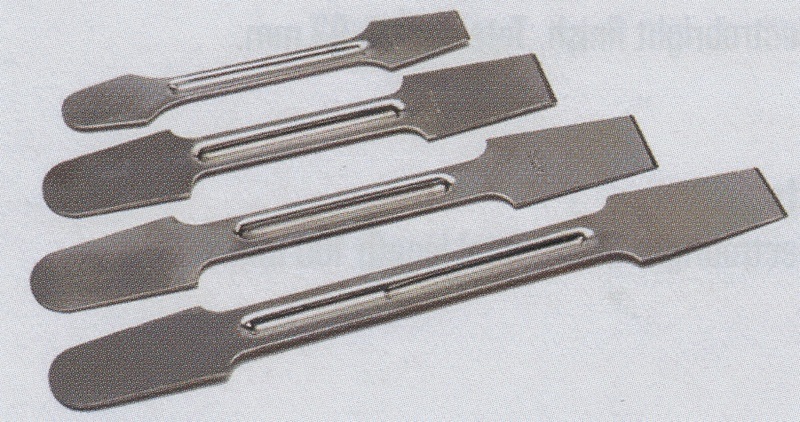 1001588 Spatula double flat ends, length 150 mm, spatula width 10 mm, pocket clip. 1001583 Flat spatula with spoon, made of AISI 304 stainless steel, flat end 10 mm wide 55 mm long, spoon end 30 mm wide 38 mm long, overall length 180 mm. 1010313 Spatula with curved ends, made of AISI 304 stainless steel, end width 11 mm, overall length 130 mm. 1001584 Spatula spoon, flat and concave, made of AISI 304 stainless steel, spatula width 12 mm, overall length 250 mm. 1000413 Mechanically operated vibrating spatula with curved end, made of AISA 304 stainless steel, width 12 mm, overall length 176 mm. 1000412 Mechanically operated vibrating spatula with grooved end, made of AISA 304 stainless steel, width 12 mm, overall length 176 mm. 1000856 Flexible spatula with AISI 304 stainless steel blade and handle, blade width 11 mm, blade length 52 mm, overall length 160 mm. 1001589 Spatula flat with spoon end, length 150 mm, spatula width 21 mm, pocket clip. 6099120 Straight flat and rounded end spatula made of AISI 304 stainless steel, width 20 mm length 120 mm. 6100120 Spatula with double curved ends, made of AISI 304 stainless steel, width 15 mm, length 120 mm. 1096190 Grooved spatula and spoon made of AISI 304 stainless steel, overall length 190 mm, flat sharp spatula end and curved spoon end designed to remove remaining residues from flasks and bottles. 1096120 Spatula with spoon and flat ends, made of AISI 304 stainless steel, width 18 mm, length 120 mm. 1196120 Spatula with spoon and flat ends, made of pure nickel, width 18 mm, length 120 mm. 6021312 Spatula with chisel and grooved spoon ends, made of AISI 304 stainless steel, width 18 mm, length 120 mm. 6121312 Spatula with chisel and grooved spoon ends, made of pure nickel, width 18 mm, length 120 mm. 1001582 Spatula with double spoon ends, made of AISI 304 stainless steel, one spoon end 25 mm long and 20 mm wide, the other spoon end 30 mm long 23 mm wide. Total length 150 mm. 5210022 Porcelain Spatula with spoon and flat ends, overall length 140 mm. 1010280 Paste knife with blade made from tempered stainless steel and handle made from wood, blade width 14 mm, overall length 80 mm. 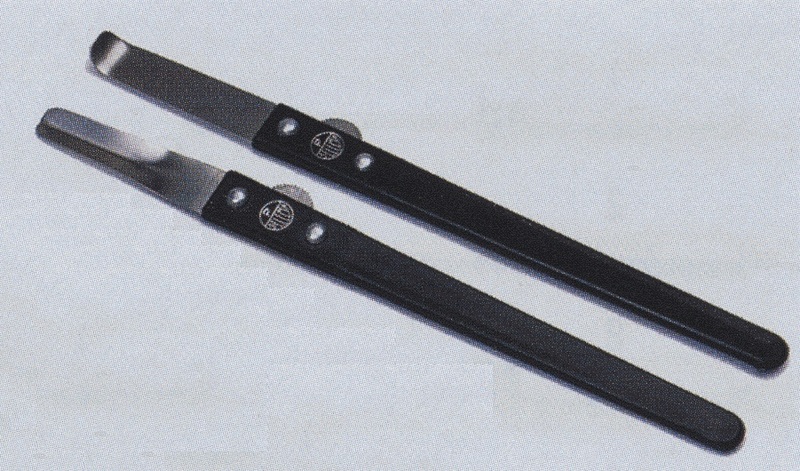 1000862 Multi-purpose knife made of stainless steel with bakelite handle, blade length 95 mm, overall length 230 mm. 1000805 Sodium spoon with 25 mm diameter brass basket, overall length 190 mm. 6000093 Fushion spoon made of AISI 304 stainless steel with a wooden handle, flat bottom with volume 90 ml and overall length 350 mm. 6000094 Fushion spoon made of AISI 304 stainless steel with a wooden handle, round bottom with volume 75 ml.amd overall length 350 mm. 6000278 Powder scoop made of AISI 304 stainless steel with length 100 mm, width 26 mm. 6001278 Powder scoop made of pure nickel with length 100 mm, width 26 mm. 1000859 Scoop with handle, made of AISI 304 stainless steel, with scoop length 100 mm, width 50 mm, capacity 120 ml, and total length 180 mm. 1001592 Scoop with handle, made of AISI 304 stainless steel, medium capacity with overall length 320 mm. 1001593 Scoop with handle, made of AISI 304 stainless steel, big capacity with overall length 360 mm. 1001594 Ladle or spoon with handle, made of AISI 304 stainless steel, capacity 100 ml, overall length 240 mm. 1001595 Ladle or spoon with handle, made of AISI 304 stainless steel, capacity 200 ml, overall length 280 mm. 1001596 Ladle or spoon with handle, made of AISI 304 stainless steel, capacity 300 ml, overall length 360 mm.